Dundas Shire (1863-1994) was created on 8 September 1863, with Hamilton as its administrative centre. The Dundas Shire was one of the early local government bodies in the western district of Victoria. 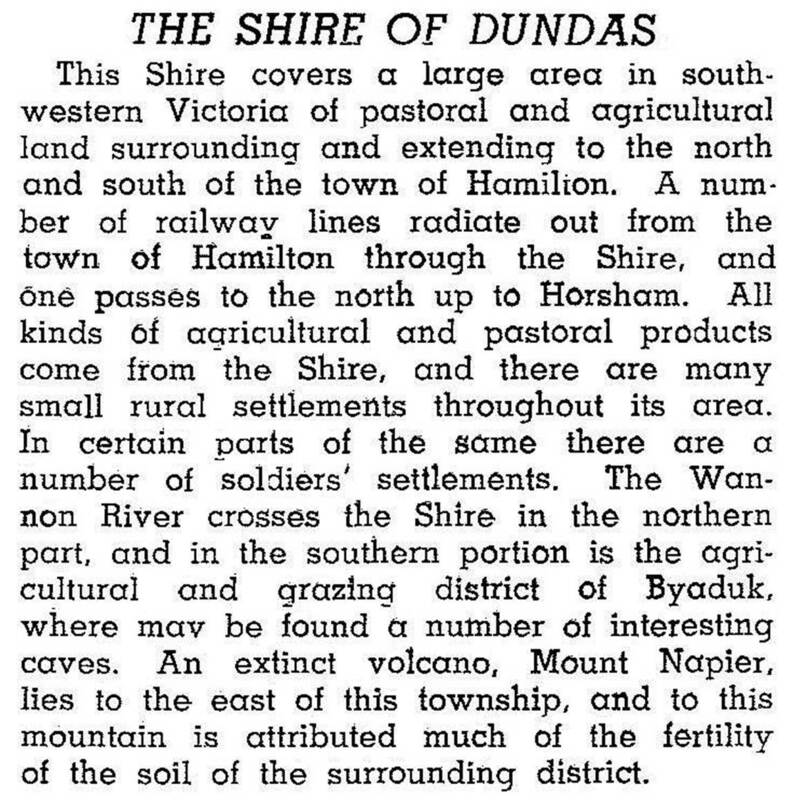 The shire's name derived from the Dundas group of hills which were named by the New South Wales Surveyor-General, Thomas Mitchell, on his Australia Felix expedition (1836), after the British Army General Sir David Dundas. Major changes were made to the shire boundaries in the intervening years, most substantially to incorporate land to the south of Hamilton stretching almost to Macarthur. It ceased to exist on 23 September 1994 when, with parts of the adjacent shires of Mount Rouse, Glenelg and Wannon, it was incorporated into the larger shire of Southern Grampians. The area and population of the shire before the restructure was 3464 sq km and 3670 persons, giving a mean population distribution of over 94 hectares per person. In 1994 farming occupied 67% of the shire's land area, with 1.32 million lambs and sheep and 43,000 cattle grazing its pastures. The shire included the Victoria and Black ranges of the Grampians, which contain examples of Aboriginal shelters and cave painting, and hence a fair portion of the Grampians National Park. Dinosaur footprints have been found in the Victoria Range to the east of Glen Isla homestead, and a large plaster cast exhibit is held in the former shire offices in Hamilton. The economy of the shire and its territorial successor was and is predominantly driven by grazing, principally sheep, but there is some mixed farming. The first European squatters arrived in the region in 1837 when three runs were established in a discontinuous belt from west to east by the Winter brothers, the Wedge brothers and Donald Cameron at Tahara, The Grange and Mount Sturgeon Plains respectively. Establishment of these runs was not without opposition from local Aborigines. The Wedges were obliged temporarily to withdraw from The Grange due to heavy stock losses in 1840. However, by attrition and in some cases fatal, ruthless and unscrupulous dealings with the Indigenous population, occupation of the land of the future shire by squatting interests was completed by 1847. The future site of Hamilton within The Grange run became the base for a police magistrate, the first named Acheson French, to bring some order to the land disputes and internecine warfare. On several occasions the native police who played a significant part in tracing stolen stock were based there. Until the 1850s, despite economic depressions in 1842 and periods of drought, the large squatting interests held major sway in the shire area. This involved a very sparse population, but as some farming began, Hamilton grew as a general service town to the district. There was closer-settlement subdivision of some estates in the early 1900s and soldier-settlement subdivisions comprising 115 blocks after World War II. Other towns in the shire included Byaduk, Cavendish, Strathkellar and Tarrington.